8:3 And another angel came and stood at the altar with a golden censer; and he was given much incense to mingle with the prayers of all the saints upon the golden altar before the throne; 4 and the smoke of the incense rose with the prayers of the saints from the hand of the angel before God. 5 Then the angel took the censer and filled it with fire from the altar and threw it on the earth; and there were peals of thunder, voices, flashes of lightning, and an earthquake. 6 Now the seven angels who had the seven trumpets made ready to blow them. As we saw with an earlier altar, the altar in these verses again is likely intended to depict a combination of altars from the Old Testament. The altar in verse 5 looks like the brazen altar of burnt offering from which the coals were taken for the incense offering. The judges of Israel marched from this altar in Ezekiel 9:1–2. Incense is often used to represent prayers, and we have already seen that same image earlier in this book. (See 5:8.) We are again reminded of Psalm 141:2 ― “Let my prayer be counted as incense before thee.” But here we see incense that is mingled with prayers. What does that mean? One commentary suggests the incense in this context denotes the intercession of Christ on our behalf as we pray to God in his name. Recall Romans 8:34 ― “Who is he that condemneth? It is Christ that died, yea rather, that is risen again, who is even at the right hand of God, who also maketh intercession for us.” Also, here we see the prayers of all the saints, as opposed to the prayers of the martyrs that we saw earlier. These verses reveal the heavenly response to the prayers of these suffering Christians coming up from the earth to God. We are reminded of the concluding comments to Jesus’ parable about prayer in Luke 18:7-8 ― “And shall not God avenge his own elect, which cry day and night unto him, though he bear long with them? I tell you that he will avenge them speedily.” Everywhere we turn we are reminded of our timeframe! Here we have the same picture: God’s people are safe in heaven. God’s enemies are on the earth. The judgment on earth is about to begin. And, as before, thunder, lightning, and earthquakes are used to depict the impending judgment of God. Trumpets are used in the Bible to depict an intervention by God into the affairs of men. The events on Mount Sinai were accompanied by a very loud trumpet blast. (Exodus 19:16, 19) Trumpets also sound in Isaiah 27:13, Joel 2:1, Zephaniah 1:16, and Zechariah 9:14. The intervention by God against Jerusalem in A.D. 70 was described in Matthew 24:31 as being accompanied by the great sound of a trumpet. Likewise, the trumpet in verse 7 also heralds the coming of God onto the stage of mankind, but here the target is Rome. Trumpets serve three primary purposes: Trumpets sound a warning alarm; Trumpets play a fanfare to announce the arrival of royalty; Trumpets summon people to battle. Each of those purposes is likely involved with the use of trumpets here, but the main purpose appears to be for sounding a warning alarm. Why are only a third affected? As we discussed before, these trumpets are intended to warn. This trumpet is not a bowl. Bowls, as we will see, pour out God’s final judgments against Rome. As with the earlier seals, these trumpets depict partial judgments that warn of the impending doom to come. Why a third and not a half or a fourth? There may be no particular reason why a third was chosen over some other fraction. It may simply be that a third represents a large portion but a portion that is still less than half. We may also be seeing thirds because we have three waves of sevens — seals, trumpets, and bowls — each of which takes away a third until nothing is left. As with the seals, we should not try to attach a specific chronology to the trumpets. They are part of the overall picture. We have already discussed how Revelation is in some ways like a painting from God. You do not look at a painting as you would a timeline. A painting is spatial rather than temporal. Remember that we have already seen the saints emerge victorious from the events that are now being described. 8 The second angel blew his trumpet, and something like a great mountain, burning with fire, was thrown into the sea; 9 and a third of the sea became blood, a third of the living creatures in the sea died, and a third of the ships were destroyed. With the second trumpet, we see a great burning mountain thrown into the sea. Once again, this trumpet affects only a third of what it touches. We have not yet reached the bowls of God’s wrath. • Zechariah 4:7 Who art thou, O great mountain? before Zerubbabel thou shalt become a plain. • Amos 4:13 For, lo, he that formeth the mountains, and createth the wind, and declareth unto man what is his thought, that maketh the morning darkness, and treadeth upon the high places of the earth, The LORD, The God of hosts, is his name. • Micah 1:4 And the mountains shall be molten under him, and the valleys shall be cleft, as wax before the fire, and as the waters that are poured down a steep place. Mountains are also sometimes used to depict kingdoms. Jeremiah 51, for example, describes Babylon as a destroying mountain that will become a burnt mountain, and Isaiah 2 describes the Lord’s kingdom as the highest of the mountains. • Jeremiah 51:25 Behold, I am against thee, O destroying mountain, saith the LORD, which destroyest all the earth: and I will stretch out mine hand upon thee, and roll thee down from the rocks, and will make thee a burnt mountain. • Isaiah 2:2 It shall come to pass in the latter days that the mountain of the house of the Lord shall be established as the highest of the mountains. The mountain in verse 8 also represents a kingdom, but rather than Babylon, this mountain represents Rome. As with the mountain in Jeremiah 51, this one also becomes a burnt mountain, but this mountain is cast into the sea. We often speak of faith that is able to move mountains. The early Christians had that faith! They prayed to God that the mountain of Rome would be cast into the sea, and it was. One of the recurring themes in this book is the power of prayer, and perhaps nowhere is that power better illustrated than here in verse 8. Verse 9 tells us what happened to the sea after that great burning mountain was cast into it. What does the sea represent? If the mountain is Rome, then the sea likely denotes the mass of humanity that made up Rome. Rome’s judgment would affect not only Rome, but would affect all who depended on Rome. It’s ultimate fall was followed by what we now call the dark ages. Finally, we once again have an interesting historical comparison with Rome. (Recall our earlier comments about the uses of such historical comparisons.) Some commentators see a similarity between the flaming mountain cast into the sea and the volcanic eruption of Mount Vesuvius in August of A.D. 79, which was shortly after Revelation was written. 10 The third angel blew his trumpet, and a great star fell from heaven, blazing like a torch, and it fell on a third of the rivers and on the fountains of water. 11 The name of the star is Wormwood. A third of the waters became wormwood, and many men died of the water, because it was made bitter. With the third trumpet, a great star falls and strikes the drinking water. Again, we are reminded of the Egyptian plagues and the water of the Nile becoming blood. A star is often used in the Bible to indicate a divine visitation. The greatest visitation in Matthew 2:2 was accompanied by a “star in the east.” In Matthew 24:29, God’s coming in judgment against Jerusalem was described with the phrase “the stars will fall from heaven.” We have also seen this image before in Revelation. The sixth seal in 6:13 was described as stars falling to earth. A falling star often depicts the judgment of God upon the earth. We will soon see that although Satan plays a role in these events, he plays a role that has been scripted by God. Satan is a defeated enemy, and God will use Satan in the judgments against Rome. Also, we should recall that Satan’s fall appears to have been due to his pride, and Rome was also guilty of great arrogance and pride. 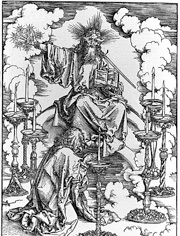 The fourth trumpet, as did the sixth seal, affects the sun, the moon, and the stars. As we have already discussed, such language is often used to depict impending judgments. In Isaiah 34:4-5 it is used to describe a judgment against Edom. In Isaiah 13:10, 13 it is used to describe the fall of Babylon. In Joel 2:10 it is used to describe a judgment against Judah. What is the source of this imagery? The heavenly bodies testify to the greatness and power of God and to the comparative insignificance of man. • Psalm 19:1 The heavens declare the glory of God; and the firmament sheweth his handywork. • Psalm 8:3-4 When I consider thy heavens, the work of thy fingers, the moon and the stars, which thou hast ordained; What is man, that thou art mindful of him? and the son of man, that thou visitest him? • Psalm 148:3 Praise ye him, sun and moon: praise him, all ye stars of light. • Romans 1:20 For the invisible things of him from the creation of the world are clearly seen, being understood by the things that are made, even his eternal power and Godhead; so that they are without excuse. Why then are they darkened? Because these symbols of joy are ashamed at the wickedness of men, and they refuse to shine their light on those who are rebelling against God. Their darkening is a symbolic picture of the total darkness that engulfs any society that turns its back on God and casts the word of God behind its back. And history tells us that before total darkness descends, there will always be the sound of warning trumpets. Can you hear them today? But the Greek word translated “eagle” can also mean “vulture.” For example, the same Greek word is found in Matthew 24:28, where in the KJV we read, “For wheresoever the carcase is, there will the eagles be gathered together,” and in the ESV we read, “Wherever the corpse is, there the vultures will gather.” Why do most translations use “eagle” here but use “vulture” in Matthew 24 for the same Greek word? Because it is not the same Greek word — one is singular and the other is plural. Eagles typically fly alone, while vultures typically do not. One rarely hears of a lone vulture, but if that was what was intended here then the image moves from being eerie to being incredibly eerie! The seven seals we saw earlier contained warnings. The seven trumpets likewise contain warnings. Why? So no one can ever say to God, “I didn’t know.” And that is a message for us as well. We also have been given many warnings about the judgment to come. With so many people in this world starving for the word of God, I shudder to think what is in store for those who sit in worship assemblies of the Lord’s church week after week and yet refuse to obey the gospel. How many warnings have they failed to heed? In a sense, God’s people “dwell in heaven” even while still on the earth! Our minds and hearts are set on things above. Some day we will dwell there literally. For now, we dwell there spiritually. 1 And the fifth angel blew his trumpet, and I saw a star fallen from heaven to earth, and he was given the key of the shaft of the bottomless pit; 2 he opened the shaft of the bottomless pit, and from the shaft rose smoke like the smoke of a great furnace, and the sun and the air were darkened with the smoke from the shaft. With the fifth trumpet, we see the first of the three woes proclaimed by the eagle in 8:13. The previous trumpets included terrors from nature, but we now begin to see terrors from beyond nature. This is also the first trumpet that directly affects man. The first four affected man only indirectly through his environment. The star fallen from heaven is spoken of as “he” who has been given a key of the shaft of the bottomless pit; that is, he has been given authority over the pit. He opens the shaft of the bottomless pit and causes darkness to cover the sun. This fallen star most likely represents Satan. In Luke 10:18, Jesus said, “I saw Satan fall like lightning from heaven.” Lenski dissents from this view, arguing instead that the star is simply the personification of the judgment that is coming from God. In my opinion, however, this fallen star is Satan. We know that Satan has been judged and cast out. (John 12:31, 16:11) And yet, Satan is called the ruler of this world. (John 12:31, 14:30, 16:11) He is called the prince of the power of the air. (Ephesians 2:2) And we are told that Satan has the power of death. (Hebrews 2:14) Where did Satan get this power? Just as God used Babylon to judge Judah, Assyria to judge Israel, Babylon to judge Assyria, Cyrus to judge Babylon, and Rome to judge Jerusalem, God is using Satan here in his judgment of Rome. Satan is a defeated enemy! Satan is doing what God commands! If Satan has any power, it is power granted him by God. Satan is on a leash! Look at verse 1. It says that Satan “was given the key of the shaft of the bottomless pit.” Satan was permitted to open that pit, but he could not have done so absent that permission from God. Satan does not even have the key to his own house unless God gives it to him! And even if our gospel is veiled, it is veiled only to those who are perishing. In their case the god of this world has blinded the minds of the unbelievers, to keep them from seeing the light of the gospel of the glory of Christ, who is the likeness of God. • Romans 1:24–28 Wherefore God also gave them up to uncleanness through the lusts of their own hearts, to dishonour their own bodies between themselves: Who changed the truth of God into a lie, and worshipped and served the creature more than the Creator, who is blessed for ever. Amen. For this cause God gave them up unto vile affections: for even their women did change the natural use into that which is against nature: And likewise also the men, leaving the natural use of the woman, burned in their lust one toward another; men with men working that which is unseemly, and receiving in themselves that recompence of their error which was meet. And even as they did not like to retain God in their knowledge, God gave them over to a reprobate mind, to do those things which are not convenient. • 2 Thessalonians 2:11-12 And for this cause God shall send them strong delusion, that they should believe a lie: That they all might be damned who believed not the truth, but had pleasure in unrighteousness. What we see here is a vivid picture of moral and spiritual decay. Does this fit with what happened to Rome? According to Gibbon one of the four primary reasons behind the eventual collapse of the Roman empire was inner decadence. As the Empire ground down, the decadent Romans were given to a thirst for violence and a gratification of the senses... . ... Apathy was the chief mark of the late Empire... . As the Roman economy slumped lower and lower, burdened with an aggravated inflation and a costly government, authoritarianism increased to counter the apathy. Since work was no longer done voluntarily, it was brought increasingly under the authority of the state, and freedoms were lost. For example, laws were passed binding small farmers to their land. So, because of the general apathy and its results, and because of oppressive control, few thought the old civilization worth saving. Rome did not fall because of external forces such as the invasion by the barbarians. Rome had no sufficient inward base; the barbarians only completed the breakdown—and Rome gradually became a ruin. And as you saw the feet and toes partly of potter’s clay and partly of iron, it shall be a divided kingdom; but some of the firmness of iron shall be in it, just as you saw iron mixed with the miry clay. And as the toes of the feet were partly iron and partly clay, so the kingdom shall be partly strong and partly brittle. Also, recall Proverbs 14:34 ― “Righteousness exalts a nation, but sin is a reproach to any people.” What does this all say to us today? Is the moral base of our country growing stronger or is it weakening? Are we being exalted by righteousness? Or are we suffering under the reproach of sin? As we study the judgment of Rome, we should pause to notice the growing similarities between Rome and our own country, from the sexual promiscuity to the glorification of violence and greed. Rome began as an instrument for God to use in the proclamation of the gospel, as did our own country. We had a similar beginning in the plan of God. Will we face a similar end? Perhaps our study of warning trumpets is more relevant than we would care to think. 3 Then from the smoke came locusts on the earth, and they were given power like the power of scorpions of the earth; 4 they were told not to harm the grass of the earth or any green growth or any tree, but only those of mankind who have not the seal of God upon their foreheads; 5 they were allowed to torture them for five months, but not to kill them, and their torture was like the torture of a scorpion, when it stings a man. 6 And in those days men will seek death and will not find it; they will long to die, and death will fly from them. 7 In appearance the locusts were like horses arrayed for battle; on their heads were what looked like crowns of gold; their faces were like human faces, 8 their hair like women’s hair, and their teeth like lions’ teeth; 9 they had scales like iron breastplates, and the noise of their wings was like the noise of many chariots with horses rushing into battle. 10 They have tails like scorpions, and stings, and their power of hurting men for five months lies in their tails. 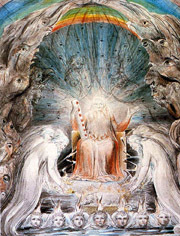 11 They have as king over them the angel of the bottomless pit; his name in Hebrew is Abaddon, and in Greek he is called Apollyon. 12 The first woe has passed; behold, two woes are still to come. The locusts breed in desert places and invade the cultivated lands for food. They may be about two inches in length, with a wing span of four to five inches. ... They will travel in a column a hundred feet deep and as much as four miles long. When such a cloud of locusts appears, it is as if there had been an eclipse of the sun and even great buildings less than two hundred feet away cannot be seen. When they move, they move inexorably on like an army with leaders. People have dug trenches, lit fires, and even fired cannon in an attempt to stop them but without success; they come on in a steady column which climbs hills, enters houses and leaves scorched earth behind. But these locusts are not ordinary locusts. Ordinary locusts attack vegetation, but these locusts are specifically told to attack men instead. In fact, in verse 4 they are instructed not to attack vegetation, but rather to attack only those men who have not received the seal on their foreheads. Who is behind this terrible judgment? Verses 2–3 tell us that the locusts come up out of the pit, and verse 11 tells us that their king is the angel of the pit. His name in verse 11 means destroyer in both Greek and Hebrew. That sounds like Satan. And yet in verse 1 we see that a trumpet from heaven starts everything. So who is behind this? God or Satan? The answer is that God is behind it because it is a judgment against Rome. Satan is involved, however. God is using Satan to punish Rome, just as he will one day use Satan to punish everyone who is ungodly. Satan is seen here as God’s instrument of punishment and judgment. A common misconception today is that God and Satan are somehow locked in a battle of good versus evil, the outcome of which is uncertain. That is not the case at all. Satan is a created being, and Satan is used by God when and how God sees fit. Satan is just one more tool that God uses in his judgment of the Roman empire. Jesus told us in John 12:31-32 that Satan was defeated at the cross. Now is the judgment of this world, now shall the ruler of this world be cast out; and I, when I am lifted up from the earth, will draw all men to myself. Jesus’ death judged the world, not Jesus. Jesus’ death defeated Satan, not Jesus. Jesus’ death draws, not repels, all men. Satan was defeated by an event that he probably, at least for a moment, thought was going to be his greatest triumph. Jesus was not what the Jews expected. I don’t think Jesus was what Satan expected either! There is much confusion about Satan in the world today. Satan is not omnipotent. Satan is not omnipresent. Satan has limitations. In fact, verse 5 tells us that Satan and his agents do not have unlimited power even over evil men! That day may come, but it has not yet come — and is there any better description of Hell than the place where God at last turns his back on the ungodly and allows Satan free reign to do whatsoever he wills? As bad as this situation now is for Rome, it is not that bad yet. The reference to scorpions in this context reminds us of Luke 10:19 ― “Behold, I give you the authority to trample on serpents and scorpions, and over all the power of the enemy, and nothing shall by any means hurt you.” And so once again, as we saw with faith to move mountains, Revelation sheds some interesting light on a difficult passage from the gospels. What do the 5 months in verse 5 depict? Some commentators say that this is the usual duration of a locust plague or the length of the dry season when the locusts generally came. Others tell us that 5 months is the average lifespan of a locust so that what we have here is one generation of locusts. Bullinger says that the number 5 depicts the grace of God in the Bible, in which case it may symbolize those who are marked during this time and are not the target of this judgment. (His case for the link between grace and the number 5 is not very good, however.) Swete thinks the number is used simply to give definiteness to the picture. Your adversary the devil prowls around like a roaring lion, seeking some one to devour. Verse 4 gives us more evidence that God is in control of this judgment. It says that those sealed with the mark of God in Chapter 7 in anticipation of the tribulation were not harmed. Recall our earlier comments about the vast difference between suffering with the guilty and suffering because you are guilty. The decadence and moral decay of Rome was not a punishment against God’s people but it did affect God’s people. Many lost their lives because of it. They were harmed physically, but not spiritually.